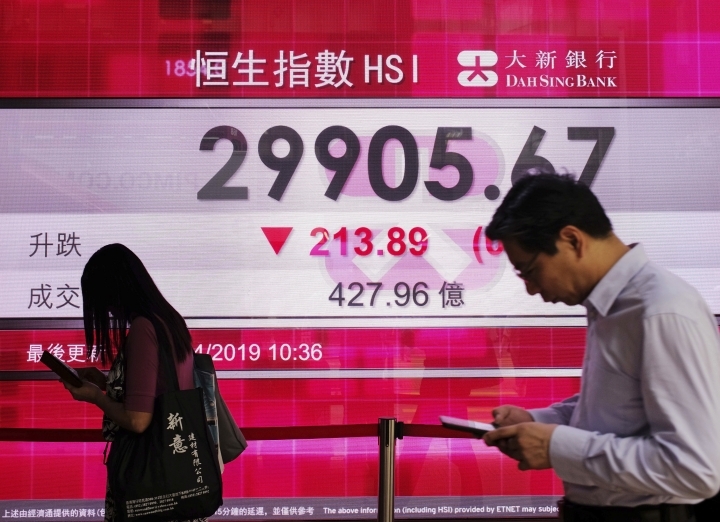 SINGAPORE — World stocks turned slightly higher on Thursday after Britain secured a new deadline for its exit from the European Union, removing the immediate threat of a crash this week that would have disrupted trade. Markets recovered in Europe after losses in Asia, with France's CAC 40 up 0.8% to 5,491, and the DAX in Germany up 0.4% to 11,948. Britain's FTSE 100 rose 0.2% to 7,437 after a lower open. Wall Street was set for a slightly higher open as future contracts for the broad S&P 500 index rose 0.2% to 2,900. That for the Dow Jones Industrial Average also rose 0.2%, to 26,219. The European Union agreed early Thursday to extend the cutoff date for Britain's exit by more than six months, giving British Prime Minister Theresa May more time to work out a plan for the country's departure. British lawmakers have three times rejected a withdrawal plan drafted by May and other European leaders. Britain now has until Oct. 31 to leave the bloc, but worries remain that lawmakers won't agree on a deal by then. "Six-and-a-half months sounds a long time, but it isn't in U.K. political terms. We have the same hopelessly divided U.K. Parliament, the same hopelessly divided Labour party, the same hated withdrawal agreement," said Michael Every, senior Asia-Pacific strategist at RaboResearch. "In short, this is a can-kicking exercise that doesn't actually kick the can very far or in a very useful direction," he added. Asian markets earlier closed mostly lower as investors responded to the release of minutes of the U.S. Federal Reserve's meeting in March. While most officials believed the central bank would leave interest rates unchanged for the rest of the year, several said their views could shift with incoming data. The indication of flexibility put markets in a "slightly soft mood," said Selena Ling, chief economist at OCBC Bank. 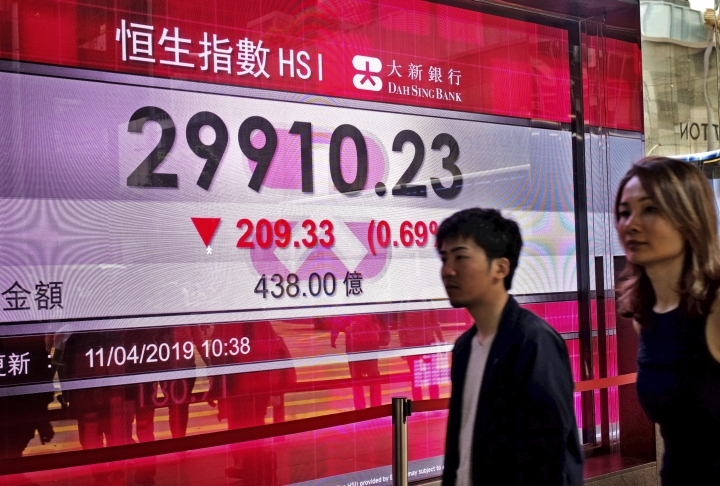 Hong Kong's Hang Seng gave up 0.9% to 29,839.45 and the Shanghai Composite index retreated 1.6% to 3,189.96. The Kospi in South Korea was flat at 2,224.44. Australia's S&P ASX 200 slid 0.4% to 6,198.70. Japan's benchmark Nikkei 225 bucked the regional trend, adding 0.1% to 21,711.38. 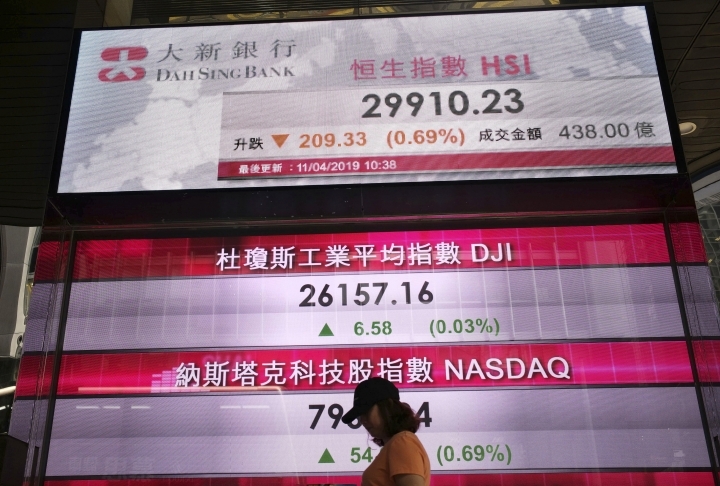 Shares fell in Taiwan, Thailand and Indonesia but rose in Singapore. ENERGY: Benchmark U.S. crude dropped 49 cents to $64.12 per barrel. It added 63 cents to settle at $64.61 per barrel on Wednesday. Brent crude shed 46 cents to $71.27 per barrel. The contract gained $1.12 to $71.73 per barrel in London. CURRENCIES: The dollar strengthened to 111.15 yen from 111 yen late Wednesday. The euro ticked up slightly to $1.1279 from $1.1273, and the British pound eased to $1.3084 from $1.3095.